Federico Cannata was born in Sicily to MODICA, a place rich in history and cultural stratifications, today a heritage of humanity, where the cult of beauty is a tradition that has been handed down for generations. Cannata has made of its land its primordial source of inspiration and style. 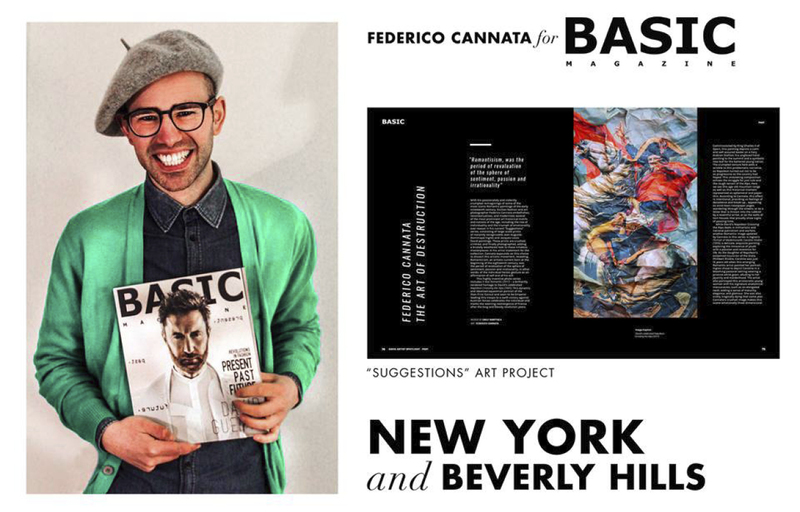 Federico Cannata starts a series of important collaborations with artists, stylists and magazines international, art galleries, hair-stylists and design companies, bringing his creative inspiration to the world. 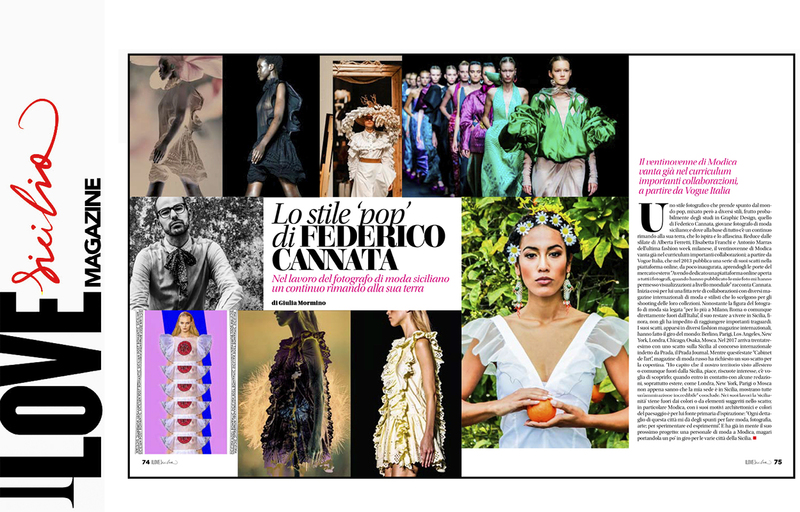 The style of Federico Cannata is a real mix of different cultures, with a pop look, never predictable, always in constant evolution. Graphic design and photography create a unique mood in his works. 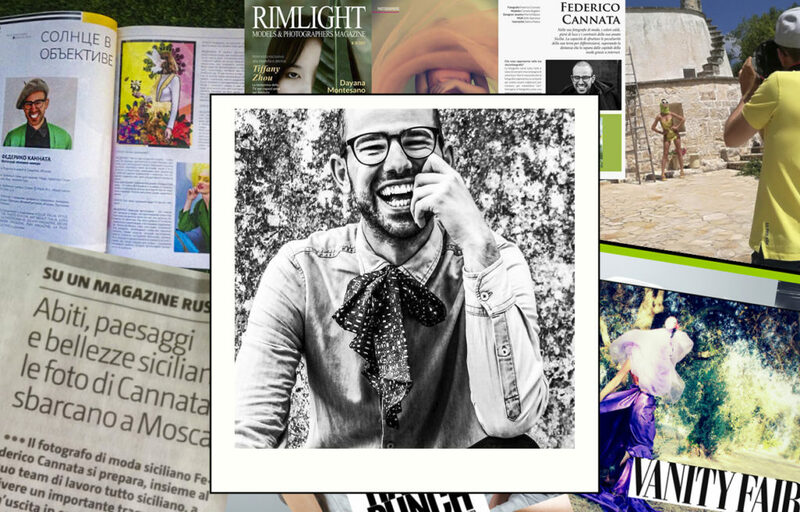 In 2013 the fashion magazine VOGUE ITALIA selects many of its photographs by realizing his personal portfolio inside the magazine, all thanks to the attentive eye of Alessia Glaviano Photo Editor of Vogue who inaugurated an entire section aimed at photographers of all the world. In 2014 he has the opportunity to be present as a photographer at PARIS FASHION WEEK for the WHO’S NEXT event, an event aimed at young creative people in the world. In September 2015 he was interviewed by the famous journalist Ilaria Introzzi for STYLE.IT by VANITY FAIR ITALIA, sharing some unpublished shots and many curiosities of his creative process on fashion photography. Then it’s the turn of THE PHOTO BEACON, a famous LONDON magazine that publishes a shot by defining the photographer as the new artist to be inspired by. In December 2015 his photographs are published in the magazine ART ABOUT ITALIA, distributed in the main photography stores throughout Italy. In 2016 he collaborates with the editorial staff of COTTO E MANGIATO of the Mediaset – Italia 1 television channel, the magazine of the famous COTTO E MANGIATO program conducted by Benedetta Parodi, realizing some advertising pages for a Made in Sicily preserves company. His photographic project “The Life of Others” is entirely published in a preview in the photographic magazine LOEIL DE LA PHOTOGRAPHIE in PARIS, hosting photographic projects by the most important photographers in the world. On the occasion of the FASHION WEEK in MILAN it will be the only Sicilian photographer to be selected for the exclusive WNFL event of the creative studio OED STUDIO of MILAN aimed at young talents from all over Italy. Together with a creative team, he will create a campaign advertising for an fashion designer. His shots dedicated to his beloved land arrive other ocean, in CANADA, in April 2016 the fashion magazine VULKAN MAGAZINE publishes the photographic series entitled “Attese”. In July, his fashion editorial entitled “New visual of Japan” was published in the magazine of ELEGANT MAGAZINE distributed among the skyscrapers of NEW YORK CITY. In 2017 he designed a special T-Shirt capsule collection for an Italian fashion house inspired by typical Italian food and lifestyle. In January 2017 he returns to collaborate with a number of important international fashion magazines, including: KROWD MAGAZINE in CANADA, BEAUNU MAGAZINE in LONDON, OBVIUOUS MAG in BEVERLY HILLS, VISIONARY MAGAZINE in NEW YORK, EN VIE FASHION MAGAZINE in OSAKA – JAPAN. 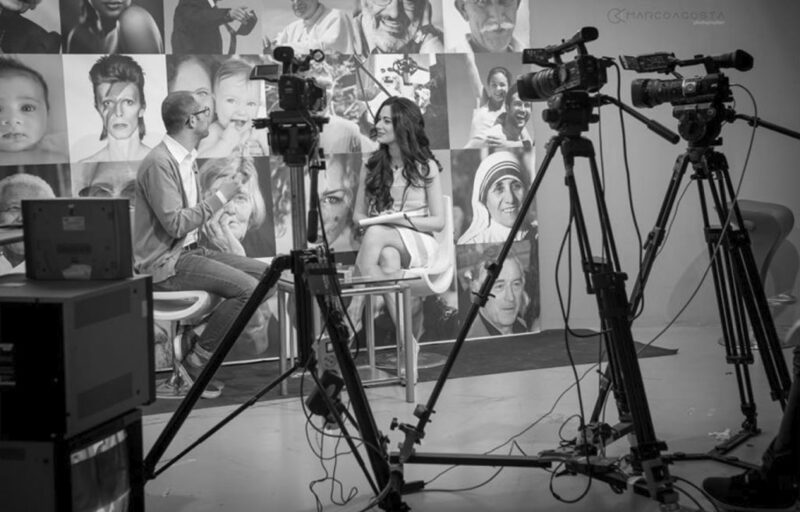 Federico Cannata has the opportunity to publish his artistic project entitled “Powerful” at a global level. In March of the same year premiered in MILAN in the international gallery of the group of architects Daaa Haus a personal project of fashion photographs entitled “The Flam”, on the occasion of the SALONE DEL MOBILE 2017. It will be set up a traveling exhibition that then touched the art gallery of architects in MALTA and RAGUSA. Federico is interviewed by fashion journalist Ramona Mondi for the magazine FNM MAGAZINE in ROME in June 2017, focusing on fashion street photography that becomes art and trend. For the TECNART design company he designs a particular collection of glass lamps inspired by the Baroque architecture and the decorative motifs that distinguish them. The collection will be presented exclusively at the HOMI MILANO 2017 International Furniture Fair. In collaboration with a jewelry manufacturer, of craftsmanship, creates a series of shots inspired by the typical Sicilian gardens for the magazine of LA PLUS BELLE MAG distributed in FRANCE, SPAIN, RUSSIA and AMERICA. 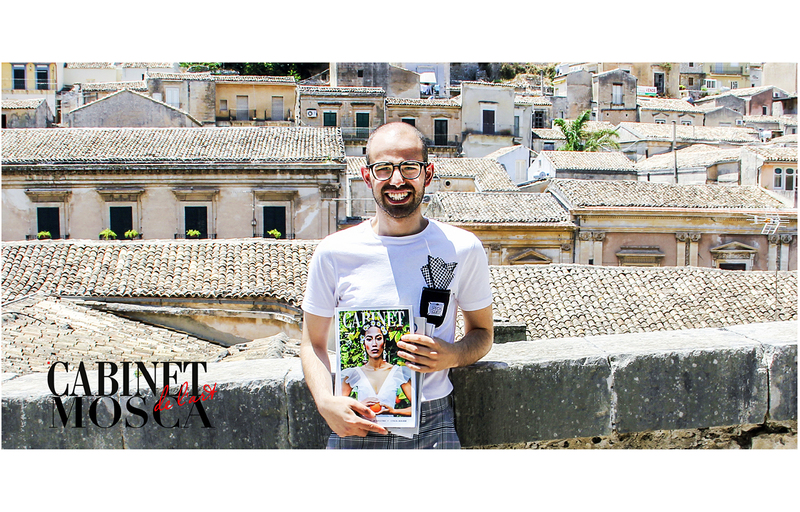 Federico Cannata is interviewed by the journalist Anastasia Viola for the magazine SICILIA E DONNA di CATANIA, one of the most important magazines in Sicily, sharing his creative path that draws the lifeblood in his homeland to be “donated” to the world. A snapshot entitled “Basic Popular Collage” is selected by the PRADA fashion house for the international PRADA JOURNAL competition. Cannata will be the only Sicilian photographer to be chosen. Once again Sicily again enchants the jury of the award. In these months he was interviewed by the journalist Christian D’Antonio for THE WAY MAGAZINE MILANO, by the fashion journalist Francesca Interlenghi for THE DUMMY’S TALES MAGAZINE MILANO and by Rocco Rossitto for the editorial staff of BONAJUTO MAGAZINE, sharing his photographic works made mainly in Sicily. PEDRO PEDRO, ANTOLINA PARIS, RHEA COSTA, photographing their new collections autumn-winter 2018-19; The photo shoots will then be published in many magazines and on specials related to the fashion week. In February 2018 he created the new advertising campaign for the designer FRANCESCA FOSSATI MILANO, for his S / S 2018 collection, which premiered on VOGUE ITALIA. On the occasion of the MILAN DESIGN WEEK 2018 his new collection of spring / summer shots 2018 entitled “Photographic Prayers” is exhibited in the futuristic gallery MAD GALLERY MILANO. The photos of the collection are extrapolated from a series of shots ready to be trashed and through a game of digital collage and extrapolation they are given a new artistic “dignity”. In July 2018 the Sicilian photographer starred in the film sets of Rome as the official photographer of the fashion magazine D-ART MAGAZINE during the haute couture spring / summer 2019 fashion shows of the prestigious ALTA ROMA event. The photos taken by Cannata will then be accompanied by the critical pen of Laura Gagliano, a well-known blogger and writer of Sicilian fashion but Roman by adoption. 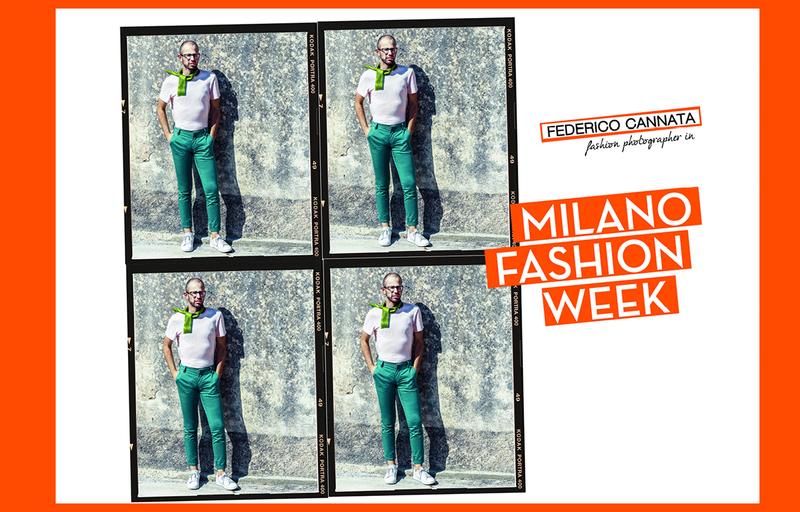 Federico Cannata will photograph the fashion shows of: Renato Balestra, Sylvio Giardina, Soocha, Marianna Cimini, Emilio Ricci, Edithmarcel and many others. 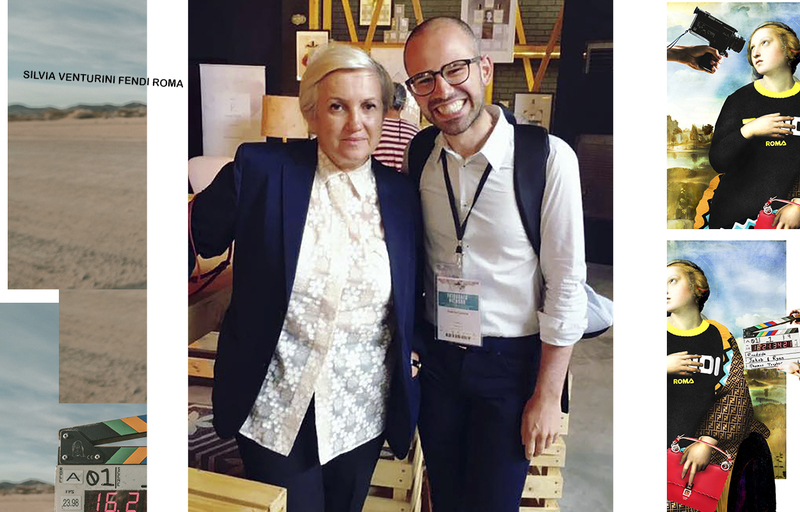 He returned to work with the couturier FRANCESCA FOSSATI MILANO for a new artistic project entitled “Ammare” linked to the new fashion collection of swimwear s /s 2019 of the fashion designer. 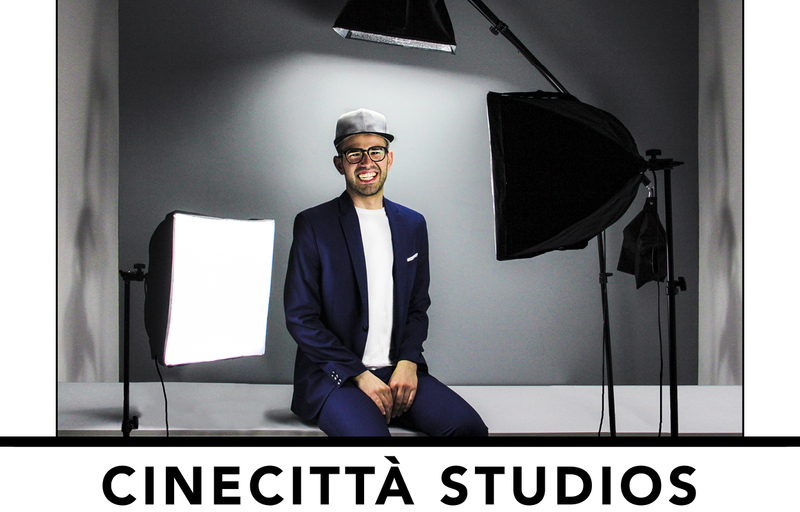 The shots made by Federico Cannata will be set in PUGLIA, in the white city of OSTUNI, right in the summer residence of the designer, very linked to this fascinating land. The collection, together with the photographs, will be presented in world premiere to journalists, buyers and prestigious clients in the “Fatto ad Arte” gallery of Milan during the Fashion Week. 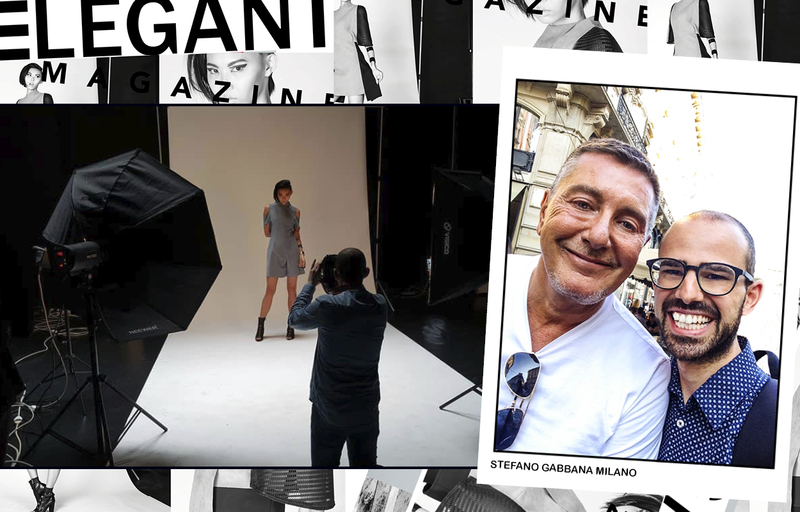 The Sicilian photographer returned to MILANO in September 2018 to follow and photograph the Fashion Week fashion shows, collaborating with some industry magazines. He will be invited again by some well-known fashion houses such as Alberta Ferretti, Antonio Marras, Elisabetta Franchi, Hogan, Borsalino, Aigner, Dimitar Dradi and many others.